Never let it be said that I thought Ronald Reagan was a great president. 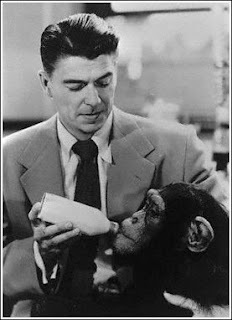 But he was a heckuva chimp-daddy. But I do believe he was a good man, and he was undeniably a powerful speaker. On Memorial Day 1983, he made these remarks in honor of fallen U.S. servicemen, and they are as true and as relevant today as they were then. This Memorial Day of 1983, we honor those brave Americans who died in the service of their country. I think an ancient scholar put it well when he wrote: ``Let us now praise famous men . . . All these were honored in their generation, and were the glory of their times. Their bodies are buried in peace; but their name liveth for evermore.'' As a tribute to their sacrifice, let us renew our resolve to remain strong enough to deter aggression, wise enough to preserve and protect our freedom, and thoughtful enough to promote lasting peace throughout the world. Today please take a moment to remember the men and women who gave their lives in service of their country. And the next time you disagree with a friend's politics or roll your eyes at a politician's partisan maneuvering, be grateful that they died to safeguard democracy and your freedom to criticize it. God Bless America and her protectors. And to the families who withstood the sacrifice of their loved ones for our sake: Thank you.